When installing the WebAssistant, the configuration of your computer is left untouched. No changes are automatically made, because WebAssistant is installed within one folder. Deinstallation.html the application - if you would ever want to ;-) - is only a matter of deleting the MM3-WebAssistant folder. WebAssistant is written in Java, and therefore cross-platform. You will need Java Virtual Machine though. Click on the file MM3-WebAssistant.jar and follow the statements. You get to know the basic principle of the WebAssistant. If you have any question, please use the step-by-step instruction. In future you are going to click on the MM3-WebAssistant.jar and you can start with archiving by surfing. After decompressing the WebAssistant ZIP archive you get the folder MM3-WebAssistant​Private. You don't need administration rights to it. The program simply can be started by clicking the file MM3-WebAssistant.jar in the folder MM3-WebAssistant​Private. After that WebAssistant starts and a logo appears. 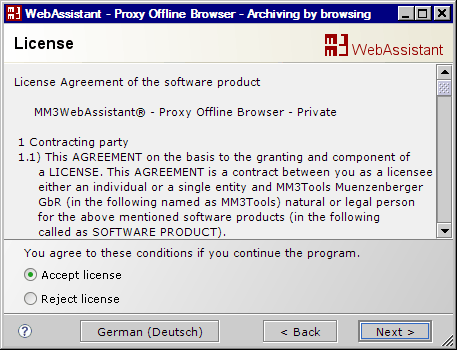 First you get a short introduction, after which the license agreement is displayed. You receive with the button Next the next dialog and with the button Back the precede dialog. Before you can use WebAssistant you will have to adjust the proxy settings in your browser. Please open your browser which you would like to use by browsing with the WebAssistant. The required proxy configuration is illustrated by a step-by-step description. Should you ever wish not to use the WebAssistant for any particular operations, just deactivate the switched-on proxy. Some browsers make it easy to switch the proxy on and off. Please follow the note to this at the end of the description of the select browser. Please, check the proxy configuration of your browser now. On this page selects your browser and the internet access. Then follow the statements in the check. Learn the basic principle now. You get to know the basic principle of the WebAssistant Archiving by Browsing with an offline test and an online test. The installation is completed after this and you already know the basic principle of the use of the MM3-WebAssistant - Proxy Offline Browser. You simply start the WebAssistant with a click on MM3-WebAssistant.jar. You can immediately then start with archiving by surfing with your browser.